Pub on Essex Road in Islington. 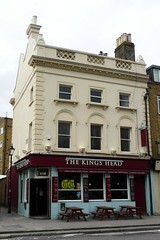 It was renamed from the King's Head in 2011, and is presumably under new management. The comments below pre-date the change of name. On our September 2010 visit as part of the 38 bus route pub crawl, there was one real ale on offer — Sharp's Cornish Coaster, which was perfectly fine. Sport was showing on the flatscreens, but with the sound off. There's a dartboard towards the back, and a beer garden of some kind out the back too. A selection of board games is available. Kake's verdict: Probably my favourite of the Essex Road pubs we visited during the 38 bus route pub crawl, mainly because it wasn't dark and noisy. Accessibility: Small step up to get in. Another step to get to the back part, where the toilets are (including one marked as accessible). Last edited 2012-04-20 13:28:25 (version 3; diff). List all versions. Page last edited 2012-04-20 13:28:25 (version 3).